I know I said I was taking a breaking from sharing recipes but this one ended up so delicious I couldn’t not share it will all of you. While looking in my fridge I saw a mix match of different foods and a delicious idea came to me. 1. Preheat oven to 350. Cover a baking sheet in run foil and spray lightly with olive oil. 2. In a small bowl mix together lime juice, Braggs, oil, ginger and cilantro. 3. Place salmon fillets on the foiled baking sheet and liberally dress with the lime Braggs mixture. 4. Place fillets in the oven for 20-25 minutes. Remove and serve hot. I severed up this fish with a delicious baby kale and blueberry salad. It was a great supper. 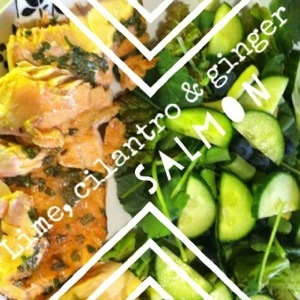 This entry was posted in Food and tagged baby kale, blueberries, clean eating, ginger, healthy-living, salmon by healingginger. Bookmark the permalink.